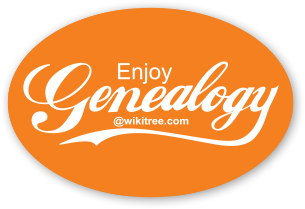 Today in some downtime (I know it’s a strange word for Genealogists – downtime is really multi-tasking) I was thinking about a new WikiTree Mentors-Tips post. 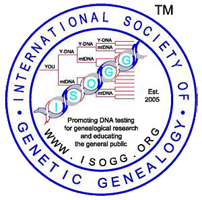 Often times I am inspired by real life events in G2G (WikiTrees Genealogist to Genealogist Forum) or a question from someone in a PM (Private Message) or email. But today I was really goofing around with My Drop-Down Menus at the top right of every WikiTree page. It’s not the My WikiTree one, the one next to it with my WikiTree ID, Gaulden-7, as the start…if you scroll down you’ll see a lot of stuff to play with. Today I was playing around with the first one in the drop-down list, Compact Tree. Made for sharing, which is very true. But what else can this widget do for us and or for someone we send it to? You can click on your Ancestor and be taken to the Profile page for them. You can see if there is a confirmed DNA Connection by seeing the DNA confirmed Icon). You can click on the Ancestor to go to the Profile to see a list of people who have also DNA tested who connect to the ancestor. Pretty nice – you can copy it to your DNA match email. You know the one you send out to people you find who have some kind of match to you. I get those all the time for my own DNA matches and Client matches… Those letters are sometimes the most confounding things I deal with daily. I got one the other day that was just a link to a family tree. What?! What do you mean when you send me nothing but a Family Tree list? Well, with the Compact Tree, you can at least send them something they can figure out. 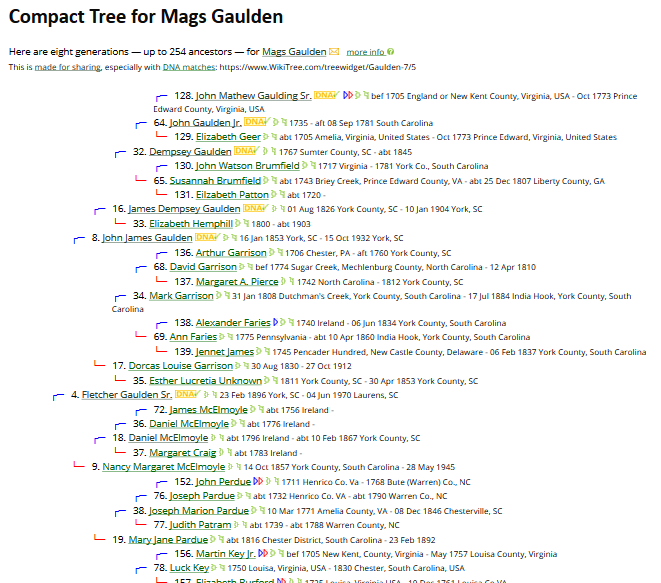 Use the compact Tree to quickly check through your Ancestors to see if there are others who have DNA tested who connect to the Ancestor. Using the information on the Profile for each DNA testor you can check to see if your paper trail is accurate. Now back to my lollygagging and doing much of nothing, shaw, it might even be a good time to have some Blueberry pie!